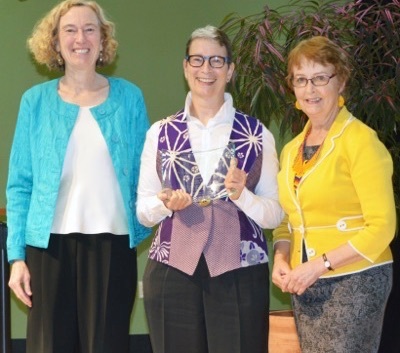 The awards were presented at the annual Fall breakfast hosted by Social Sciences Dean Katharyne Mitchell. "Every year, we get together to celebrate our achievements and to show appreciation to the people whose hard work makes this division exceptional," said Mitchell. "It's a highlight of the year to honor the achievements and contributions of people across the Division of Social Sciences." Golden Apple Teaching Award: Cindy Cruz, an associate professor of education, was recognized for her enthusiasm, innovative teaching practices, and for "working tirelessly to address social justice issues in all her courses and to support all students’ learning and understanding." Students consistently rate her teaching as exceptional, and the selection committee recognized her dedication to supporting students of color, first-generation college students, LGBTQ students, and those who need extra support to develop their writing skills. Cruz, who joined the faculty in 2008, received a $2,500 cash award and a golden apple trophy. Martin M. Chemers Award for Outstanding Research: Anthropology Professor Lisa Rofel was recognized as a leading China scholar whose expertise includes the transition from socialism to capitalism and related issues of gender, labor, and social inequality, as well as queerness in the new China. Rofel has produced "substantial and influential" publications and was cited for her leadership of a new project, The Twenty-First Century Silk Road, which has attracted considerable support from the National Science Foundation. Rofel is also the inaugural director of the Center for Emerging Worlds at UCSC, which focuses on understanding the global transformations of the 21st century and making the world more just. Rofel, who joined the faculty in 1991, received a $2,500 cash prize and a crystal trophy. 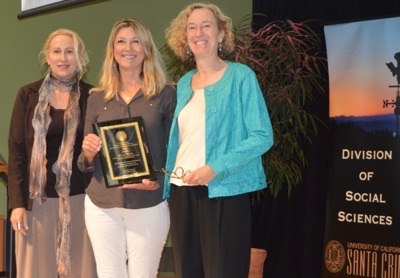 Outstanding Staff Awards: Two recipients were selected this year: Tina Cossaboom, the undergraduate program advisor in Sociology, and Betsy Tyler, the academic payroll coordinator for the Division of Social Sciences. Cossaboom was recognized for going "over and beyond" in her advising to ensure that students graduate on time. Last year, Cossaboom single-handedly created a peer-mentoring program that supports undergraduates and gives mentors valuable experience in counseling and working with a wide range of students. She was lauded as being "extremely organized," an excellent communicator, and "generous of spirit." Tyler was recognized as one of the "unsung heroes" who labors behind the scenes, providing outstanding service in support of the operations of the Division. The selection committee noted that "every single person who interacts with her always sings her praises and recognizes her value to the division." The co-recipients will share the $2,000 cash prize and each will receive a plaque. Distinguished Social Sciences Emeriti Award: Rodney Ogawa, professor emeritus of education, was honored for his leadership role in the Silicon Valley Regional Data Trust, an ambitious data-sharing initiative that supports more than 400,000 public school children in Santa Cruz, Santa Clara, and San Mateo counties. The data trust is designed to connect educators with social service providers to improve the educational outcomes of youth. Ogawa shepherded the initiative from concept to an active partnership that has been identified by the State Assembly as a pilot project for California. Ogawa joined the faculty in 2002 and retired in 2015. The award includes a plaque.